This is the new Flying Horse 66cc/80cc 2-Stroke Bike Engine Kit. Question: How do I start and stop my bike with the Silver Flying Horse 66cc/80cc Bicycle Engine? 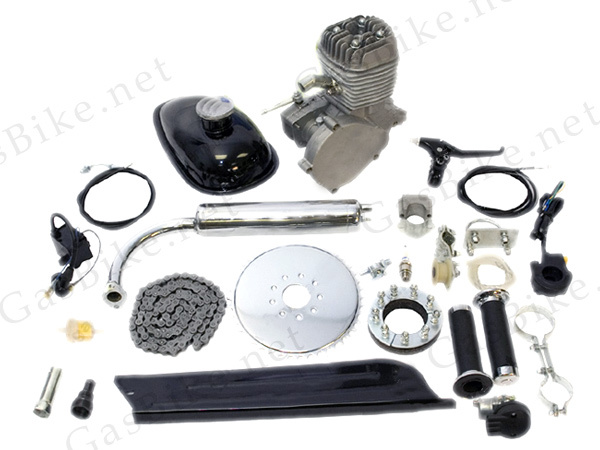 This bike engine kit fits most mens 24" and larger bicycles which includes mountain, cruiser, chopper and road bikes with a V-frame and at least a 8.5" height clearance for the engine. Larger frame size requires drilling into bike frame and use of the universal face plate. Large bikes (with larger frames/down tubes) may require the Universal Motor Mount. 80cc engine kit is about 8.5" height 7" length 5" width. Kit fits on standard 25mm to 29mm frame tube. Larger frame size requires drilling into bike frame and use the universal face plate. Ensure proper fit by reviewing the minimum dimensions. For International and Canadian shipping we suggest UPS STANDARD. This does not cover Customs Brokerage, Duties, and Taxes… these are charged to the consignee on delivery.We have found that this is the cheapest way to send packages Internationally and to Canada. Down through the years China bike engine factories have always advertised their biggest engine as 80cc therefore we have listed them the same way on our website. However, the bore and stroke of an 80cc being 47x38mm only equals 66cc. Therefore there is no such thing as an 80cc bike motor and it truly does not exists and we want to make sure that you are aware of this.